Brandy Lynn Maslowski, the host of Canadian Quilt Talk, is constantly telling her listeners to share quilting with a younger generation - on her talk show, her blog and everywhere she plays on social media. But she’s not just talking about it - now she’s making a move to get her children’s picture book, Kristy’s Quilt, published and in the hands and hearts of quilters and children everywhere! 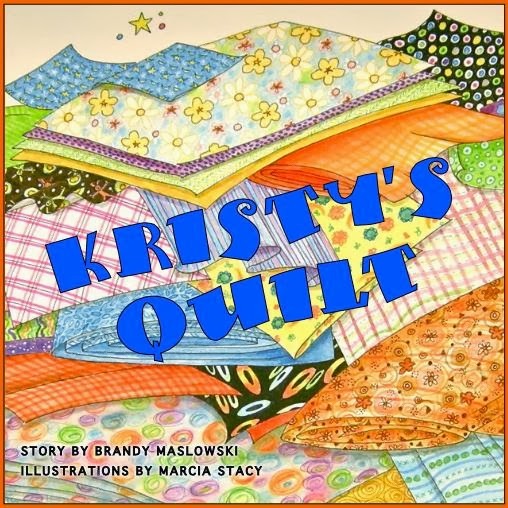 Kristy's Quilt is a heartwarming quilt adventure for ages 2-92 and is based on a true story. This children's book features 10-year-old Kristy, a spunky little quilter who blossoms at the In Stitches Quilting Retreat. Want to help get Kristy's Quilt published? Join Brandy Lynn from Feb. 14th to Mar. 15th for the Kristy’s Quilt Kickstarter campaign! Supporters of the project (like you) fund the book in exchange for early-bird copies and other fantastic rewards. Basically, if you back the project for $20 or more you’ll be one of the first people on earth to get a copy of the book in your hands this spring. You can choose any level of funding from $5 and up for all kinds of great rewards including bookmarks, softcover or hardcover copies, a doll quilt made by Brandy herself, and more. And most importantly, once the book is in your hands, you’ll be able to share your love of quilting with a child. YOU CAN SUPPORT THIS HEARTWARMING PROJECT starting on Valentine’s Day and anytime from February 14th to March 14th by visiting the KRISTY’S QUILT PROJECT. Thank you for sharing the heritage of quilting with a child. You can connect with Brandy Lynn at www.brandylyndesigns.com.